Why Rotationally Molded Polymer Resin? Armeria's products are rotationally molded using heat, air, and recycled water. Therefore, it is a very clean manufacturing process. This continual biaxial rotation of the mold during the fusion process internally strengthens even the deepest corners and crevices of every part and the color is molded all the way through so it will never chip, crack or rust. 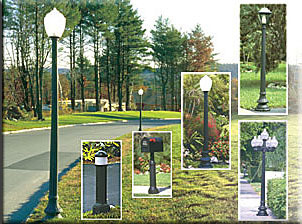 Polymer resin streetscape and site furnishing products can be made with up to 100% recycled material content. 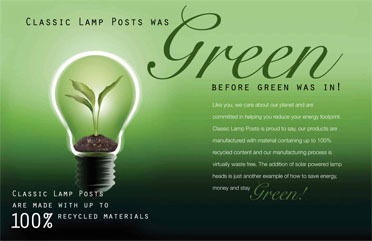 With our products... recycled material percentages increase with the darkness of color. Black planters can be manufactured from 100% recycled material. Terracotta colored planters can contain up to 20% recycled material. Products manufactured with polymer resin "type 2" can be 100% recycled after usage. Our Polymer Resin containers carry a 10 year warranty which is approximately 9 years longer than competitors with fiberglass or metal containers. This same polymer resin material is utilized as the outside body encasement of all our lighting products. This is why they are extremely durable, will not chip or crack and never rust. These products are durable yet light weight. Therefore, they can nest and stack for reduced freight expense. There are tremendous savings on installation. You can pick them up and move them around. Once in the proper location and installed or filled with plant material they are not going anywhere. Products clean up easily with soap and water, or in extreme cases with a power washer. Graffiti can even be removed with a paint remover and not damage the container. Custom designed high quality graphics can be molded in to or onto our products.